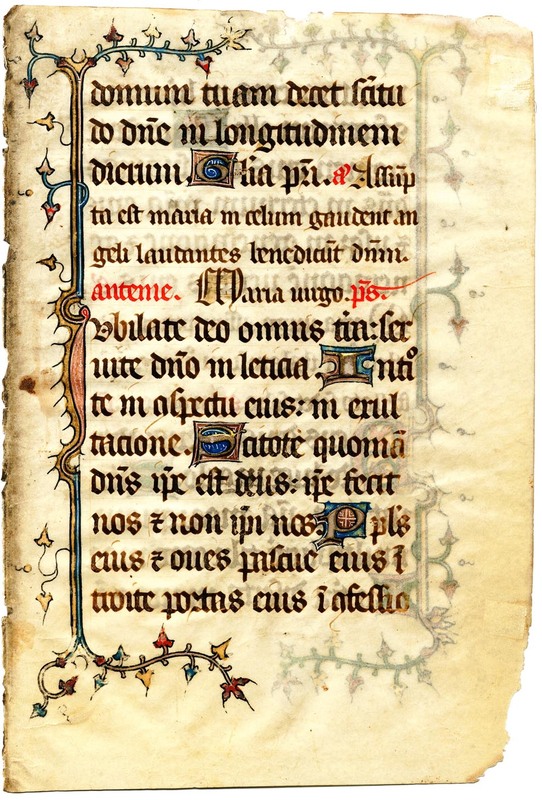 Text: The Hours of the Virgin at Lauds, including text from Psalms 92 and 99 (recto) and 62 (verso). domum tuam decet sanctitudo Domine, in longitudine dierum. Gloria Patri. Ant. Assumpta est Maria in celum gaudent angeli laudantes benedicunt domini. [Psalms 92] ...holiness becometh thy house O Lord, for length of days. Glory be to the Father. Ant. [ ]. Ant. [ ]. [Psalms 99] Make ye joy to God all the earth: serve ye our Lord in gladness. Enter ye in before his sight: in jollity. Know ye that our Lord he is God: he made us, and not we ourselves. His people, and the sheep of his pasture, enter ye into his gates in confession. -ne: atria eius in hymnis confitemini illi. 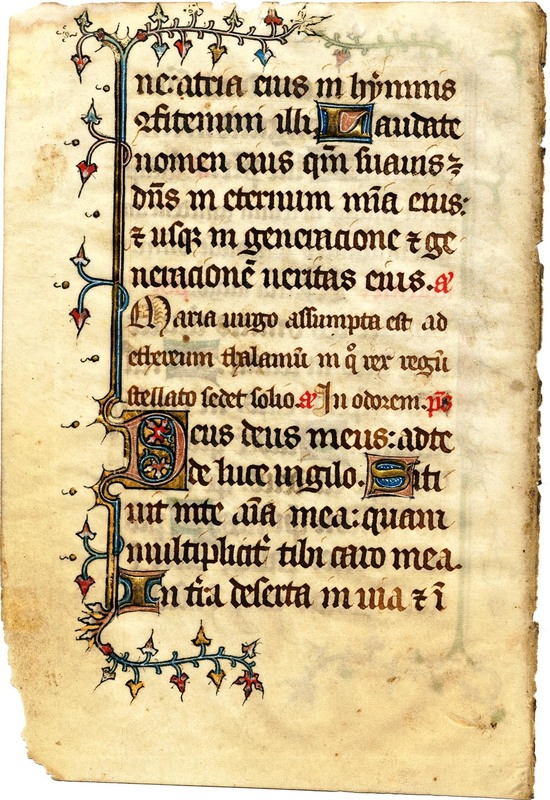 Laudate nomen eius, quoniam suavis Dominus: in aeternum misericordia eius, et usque in generationem, et generationem veritas eius. A. Maria virgo assumpta est ad ethereum thalamum in [ ] stellato sedet solio. A. In odorem. Ps. [Psalms 99] ...his courts in hymns confess ye to him. Praise ye his name, because our Lord is sweet: his mercy for ever and his truth even unto generation, and generation. A. [ ]. A. [ ].